There are currently 86 people online. 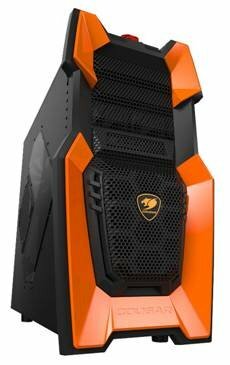 COUGAR, leading German PC case and power supply brand, officially announces their latest high-end PC gaming case, the COUGAR Challenger. The CHALLENGER mid-tower case is particularly targeting gamers demanding for huge upgradeability capacity, best airflow and optimized ventilation characteristics. COUGAR’s specific black and orange color combination paired with the large metal-mesh front bezel lend it an aggressive yet stylish appearance. But the ultimate design high-light is to be found right on the top of the case: to power up your computer you first have to lift a cover lid just like a pilot unlocks the missile button to fire. A safety feature to prevent accidental touch, which at the same time makes you feel in gaming mode right away. To play even most advanced games, the COUGAR CHALLENGER offers sufficient space for powerful graphics cards of up to 410mm length. To play even most advanced games, the COUGAR CHALLANGER offers sufficient space for powerful graphics cards of up to 410mm length. This is achieved by a unique 3-Mode drive cage concept. In standard mode there is 300mm of space, by using a special HDD track mechanism you can relocate the drive cage to you gain another 30mm, and when removing it entirely you get the maximum of 410mm. It’s already a given for COUGAR to provide for vented PCIe slots at the back, and have advanced ventilation options on the front bezel. But now the German brand goes one step further. Innovative air filters on the bottom PSU cover and the side panel prevent dust from entering the inside and piling up there, BUT on top of things, COUGAR made things much more effective and convenient. These filters are now attached on the outside with a magnetic mechanism, allowing for easiest assembly and disassembly. This way it is incredibly easy to take the dust filters off at any given time, without the need to open the case, and simply clean them under your water standpipe for a minute, dry them and put them back on. Deal done, and your ventilation has been re-optimized within minutes a not efforts at all. A large 20 cm intake LED-fan in the front and an 12 cm rear Turbine exhaust fan come pre-installed and therefore provide for excellent ventilation characteristics right out of the box. As PC enthusiast and gamers are constantly working on improving and upgrading their systems, it is of utmost importance to always have easy and clean access to the entire system. Therefore the COUGAR Challenger comes with a huge cutout on the motherboard backplate, allowing for spacious room to install or exchange CPU coolers. In addition, the newly designed cable management keeps cables away from the setup and tunnels them in a way so users can easily keep track of their hardwares’ lifelines and change them conveniently at will. As a matter of course, this also is precondition for optimized ventilation characteristics of the overall setup. As liquid cooling is strongly coming back these days, COUGAR is taking these needs fully in account, giving users the thumbs up for highly advanced cooling solutions. A total of three liquid cooling hose holes on the rear panel allows for a maximum of accessibility. By default, COUGAR implements rubber protection of these holes, so users don’t need to worry about potentially sharp edges cutting into the hoses by un-careful handling.